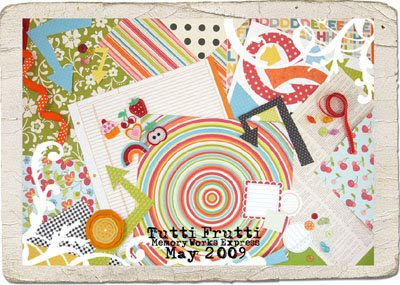 A Matter of Memories: :MEMORYWORKS EXPRESS: May 2009 Kit - "Tutti Frutti"
:MEMORYWORKS EXPRESS: May 2009 Kit - "Tutti Frutti"
Isn't life a little more fun when you have a bright and bold array of choices? This months' kit is so full of yummy colors and delicious flavor combinations you're just going to want to gobble it up! We are so excited to bring to you our May MemoryWorks Express kit "Tutti Frutti". Delve into the fabulous, fresh, and fruity colors and patterns; and don't forget to top it all off with all of the irresistibly juicy embellishments and page enhancements. So get creative and experiment with all of the fruity goodness!